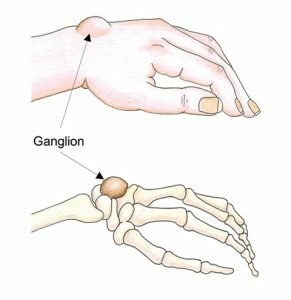 This page will provide you with information about excision of a ganglion. For further details, please speak to your consultant. A ganglion is an abnormal lump that develops underneath the skin. The majority of ganglions form near the wrist joint, though they may also appear on the foot or ankle. Ganglions contain a thick fluid, called synovial fluid, which cushions and lubricates joints and tendons during movement. A ganglion is formed when the synovial fluid leaks and gathers beneath the skin. Surgery is the best way to ensure a ganglion won’t come back. Both the discomfort and the lump should disappear. Within one or two years a ganglion will often disperse on its own. If discomfort is minimal it is usually best left alone. Using a needle, it is possible to draw out fluid from the ganglion. This will often improve discomfort for a while. Steroids (cortisone) can also be used to reduce the size of a ganglion. These treatments are not usually a long-term remedy. Various anaesthetic techniques are possible. The operation is short and usually takes between a quarter of an hour and half an hour. The surgeon will make a small incision at the site of the ganglion and gently prize the ganglion from the nearby tendons, nerves and blood vessels. The ganglion is then removed. It is very likely you will go home the same day. Regular exercise should help you to return to normal activities as soon as possible. Before you start, consult your doctor or a member of the healthcare team for advice. Expect the joint where the ganglion was to ache for a while, however joint stiffness will most likely improve in a few days. Occasionally ganglions may come back. The excision of a ganglion is a straightforward procedure.